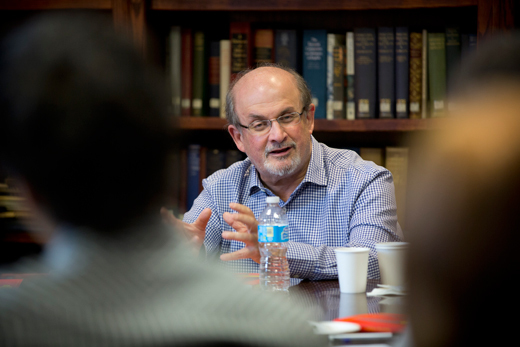 In his role as University Distinguished Professor, Salman Rushdie visits a variety of classes at Emory to discuss literature and its relationship in the world. Emory Photo/Video. Explore literary arts at Emory. When Salman Rushdie was a child, his father shared with him the great "wonder tales" of the East — "told them and re-told them and re-made them and re-invented them in his own way," the acclaimed author recalled. The stories all belonged to him, "just as they belonged to his father and to everyone else … his to alter and renew and discard and pick up again" whenever he pleased … "to give the stories life by loving them and to be given life by them in return." "This is the beauty of the wonder tale and its descendant, which is fiction," explained Rushdie, an award-winning writer of fiction, non-fiction and essays who admits that he's most comfortable when engaged in the "art of the not true." "Only by the fictionality of fiction, the imaginativeness of the imagination, the dream songs of our dreams can we hope to approach the new and to create fiction, once again, that may be more interesting than the facts," he explained. And so the author spun his own tale, exploring the roots of his love of literature — and foreshadowing a novel he's currently writing — during a lecture Sunday, Feb. 16 at Glenn Auditorium that launched his two-week visit to Emory as University Distinguished Professor. This marks Rushdie's eighth year teaching at Emory College of Arts and Sciences — a role that leads him on a rigorous schedule meeting with students and faculty in the College and across campus to discuss literature and film, cross-cultural communication and psychology, philosophy and South Asian studies. Though best known for his literary contributions, it is his teaching role that "deserves special commendation, not just for its seriousness and depth … but for its breadth and underlying spirit of generosity," as Rushdie engages scholars and students at every level, says Robin Forman, dean of Emory College of Arts & Sciences, which is Rushdie's intellectual home at Emory. 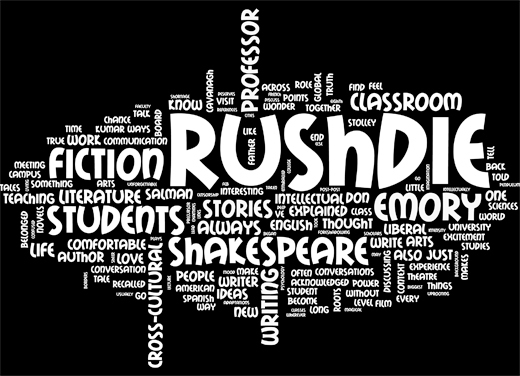 The sheer variety of his classroom appearances showcases both Rushdie's intellectual flexibility and his ease with student engagement; a sense-maker who lends insight, context and anecdotes wherever he lands. In English Professor Sheila Cavanagh's "Shakespeare, Text and Performance" class, Rushdie not only dissected the finer points of "Twelfth Night" — running lines with students and discussing recent theatrical productions — but described what it's like to stand upon "400-year-old peanut shells" within the excavated remains of Shakespeare's original Curtain Theatre, a precursor to the Globe Theatre discovered in 2012 beneath a London construction site. "Where Shakespeare was on stage," he recalled, smiling. "It's a very electric space." One moment, Rushdie is discussing short stories in an English seminar; the next he's critiquing global French cinema with a film studies class, or squeezing in a meeting at the Manuscript, Archives and Rare Books Library (MARBL), which houses his archive. On an elevator in Callaway Center between classes, Rushdie said that he enjoys the intensity of it all. "I'm always a little scared beforehand, but we usually end up having fun," he quipped. "Being amongst very smart people and all of their ideas? How bad is that?" When Rushdie arrives, she points to the board, explaining that students were brainstorming about where to lead the conversation. "Looks remarkably like the inside of my head," he joked. How cross-cultural background affects his writing: "For a long time, it confused me. It took me a long time to find who I was as a writer; I think that had to do with the uprooting. Before I could write anything worth reading I had to resolve those confusions." How he identifies himself culturally: "I try not to. It's an interesting thing to come from more than one place. (Born in India, educated in England) I've always been a migrant somewhere; you become very comfortable with it. I find myself identifying with cities more than countries…"
Favorite writing genre: "I've always thought of fiction as the real job; always thought the reason I became a writer was to write novels." Biggest challenge with book publishing in the U.S.: "The shortage of translations. So little (international) work makes it into the U.S. That means American readers simply don't know what the rest of the world is thinking or dreaming or arguing about…"
Afterward, Stolley observed, "The students were enthralled. I could see that the experience had deepened their understanding of the very issues we'd been talking about. "And I also appreciated the wonderful excitement of something new," she added. "I work on early 16th, 17th and 18th century writing in Spanish America — I don't often have the chance to engage with living authors. So it was an opportunity, in some ways, to be a student while also being a teacher." When Cavanagh considers the students in her classroom, she knows "the vast majority, are not going to become Shakespeare professors or Shakespeare actors." But the chance to have one-on-one conversations with Rushdie about Shakespeare's plays is, in some ways, "the embodiment of a liberal arts education," she said. "I want students to go away with some sense of the intellectual excitement, the pleasure of language and ideas, so that at some point they can talk about this and make it part of their intellectual and cultural life, linking things together," she said. "That's something that Salman Rushdie represents – having an eclectic mind, pulling things together in ways students might not have thought about." For Emory students, discovering how down-to-earth and approachable Rushdie is often comes as a surprise, said Rebecca Kumar, a doctoral candidate in the English department who has worked with the author since he first began teaching at Emory College and hosts an annual dinner for Rushdie and graduate students. "I am inspired by how intellectually nimble he is," Kumar said. "I also admire how easily he makes people feel comfortable — he can talk to all sorts of people from students to professors, to those outside of the academy. He's energized by curiosity, just taken with every level of the learning process." Rushdie's work at Emory has not only inspired her own teaching, it has impacted her dissertation, which examines post-colonial adaptations of Shakespeare as translated in a global context. "I don't know how you could write about it without being influenced," she said. "Every single one of his novels references Shakespeare." As for his own writing life, Rushdie acknowledged that he is working on new fiction, the "power of the fantastic" that he most enjoys. "After several years of trying as rigorously as I could to tell the truth, I had a deep hunger for fiction," he explained. "My mood swung from one end of the literary pendulum to the other, tales full of beautiful impossibility." "'Go back there' I told myself, 'Go back to the roots of fiction.' Tell the stories you love to read."